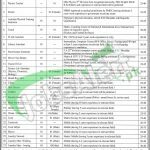 Today here at this job page you will enjoy the latest career offer from Punjab Daanish School Dera Ghazi Khan Jobs 2016 Current Vacancies. One of the best and the leading chain of Schools in Punjab which are owned by the Govt of Punjab named Daanish Schools is looking to recruit the well disciplined, caliber, adroit, and energetic applicants are required to apply for the Faculty and Non-Faculty Posts which includes Chemistry Teacher, English Teacher, Physics Teacher, Assistant Physical Training Instructor, Coach, IT Lab Assistant, Library Attendant, Store Keeper (General), Driver (Van Bolan), Tractor Driver, Science Lab Attendant (Physics, Chemistry, Biology), Hostel Boy/Girl, Tailor, Hair Dresser, Cobbler, Security Guards, Black Smith, Janitor/Sweeper, Waiter/Dishwasher, Cook, Tandoorchi, Cook Helper, Mason, Laundry Steward, Laundry-Washing and Laundry Man-Ironing are required to apply for these posts with overall educational degrees of MS.c, Ph.D, M.Phil, M.ed, B.ed, MBBS, BS.c/BCS, Intermediate, FA/FS.c, Matric, Middle is required with relevant field and working expertise are required to apply for these posts. Male & Female both are liable to apply. Age limits are different for each post. Applicants will be given best remuneration package with growth offers. So, if you are still thinking stop it and apply as soon as possible, Now, let's move on towards its applying criteria below. All those applicants who are having the domicile of Punjab are required to apply for these posts have to send the CV with supported and attested copies of educational and experience certificates and 2 recent passport size photographs should reach at the proper address. Last date for applying is 30th November 2016. 5% quota is reserved for Minorities and 2% for Disable applicants but under Disable applicants quota the deaf, dumb and blind applicants are not eligible to apply. The department reserves the right to reject any application form without assigning any reason. The domicile holders of Punjab are eligible to apply. At the time of interview original credentials should be produced. Address: Principal, Daanish School (Boys & Girls), Near By Pass 3 Km Taunsa Road Dera Ghazi Khan.